Written to explain why children need to play and offering practical guidance on how to best support children’s development through play, this fully updated third edition includes a wealth of new information to reflect recent changes in the curriculum and early years qualifications. 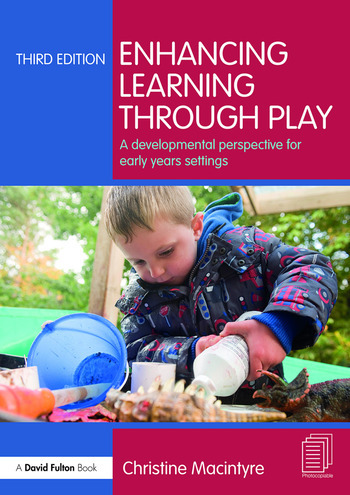 Featuring new chapters on pretend play and the impact of parenting on child development, the book addresses practitioners key concerns through an accessible Q&A format supported with case studies relating to different play situations. It encourages the reader to challenge their own perceptions about play, exploring why children behave as they do at different stages in their development and showing how play can complement and enhance their social, emotional, perceptual motor and intellectual development. a clear and detailed explanation of the different kinds of play children engage in as they learn and grow. how children learn through their play in a variety of situations. the subtle but genuine differences between male and female development. the difficulties children may have when they have over or under sensitivity to any specific sense or any problems with movement. the importance of emotional well being in children and how this affects their ability to play. an introduction to senses and brain development. Providing a grounded and gentle introduction to child development, this book brings a deeper understanding of children’s learning through play and is an invaluable resource for students on early years courses and practitioners. 1 Setting the play scene 2 Identifying Children’s learning in different episodes of Play 3 Three critically important issues. 4 Understanding the importance of imitating or copying and pretending - Developing a theory of mind - Building a positive self-esteem. 5 Understanding and Supporting children who find it difficult to play. 6 Understanding sensory integration and the early development of the brain. Appendix 1 Stepping Stones Showing Progress in Movement and Language. Christine Macintyre is a Fellow of Edinburgh University where she was Senior Lecturer in the Department of Child Education. She is currently involved in professional development work in the UK and abroad. She has published over 20 books in the field of early years education and special educational needs.